Integrate 360 Physical Therapy is a Postural Restoration Certified clinic. That means that our treatments are centered around the Postural Restoration Institute's (PRI) school of thought and our therapists are either PRI certified and/or have received ongoing education from the institute (their website can be found here). When evaluating someone either for the first time or for a follow up session, we like to know their postural pattern. Diagnosing the correct pattern not only allows us to convey a large amount of information quickly to either another provider or in our documentation, but it helps us decide how we need to move forward in your rehabilitation. The patterns are often abbreviated and describe the patient's musculoskeletal position as well as over and underactive muscles. Here's a breakdown of the basic or most common patterns. AIC- This stands for anterior interior chain and usually affects the left side. This is the most basic pattern developed when our body starts to get into poor postures or move in less than ideal ways. Our diaphragm is the muscle that connects our thorax to our lower back and is the primary muscle of inspiration. This means we use it 20,000-24,000 times a day and if it is not working correctly, it can have dramatic effects on our posture. Because it has a larger attachment on the right side, it is more stable there. When the diaphragm is not in good position or isn't utilized properly, the left side of it will flatten out. This will cause our left ribs to flare out and will turn off our left abdominals. Our trunks will then bend toward the right a bit. Additionally, when our left abdominals turn off, the left side of our pelvis will rotate forward. These malalignments make us stand more on our right leg than our left. People in this pattern will feel more weight on their right foot than left, and the weight will be on the outside of our right foot, but on the arch of our left foot. This pattern can give rise to many different types of pain, but typically lower back, knee, and/or hip pain on either side is common. 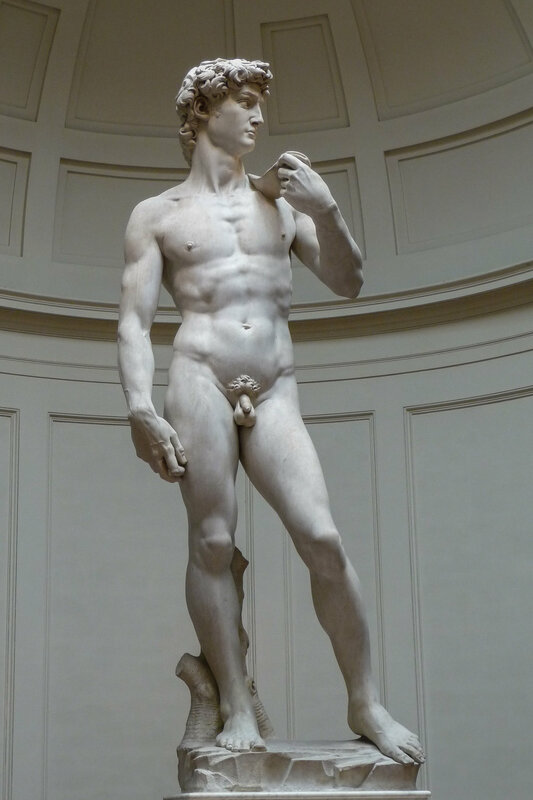 The Statue of David is a good example of this pattern. PEC - This stands for posterior exterior chain. This typically happens when someone has been in an AIC pattern for some time and they have compensated to try to avoid pain or promote function. This is essentially an AIC, but on both sides. Both sides of the pelvis have rotated forward which causes the lower back to dramatically arch. This will then cause the thorax to lean back, ribs to flare out on both sides (turning off the abdominals on both sides). We will then typically move our shoulders and shoulder blades forward in order to reach things in front of us, and develop a forwardly positioned head. This pattern still gives rise to lower back, hip, and knee pain, but can also cause shoulder and neck pain as well as headaches. BC- This stands for brachial chain and typically refers to the position of the thorax and shoulders. This can affect one or both sides and is simply called a left/right or bilateral brachial chain. This is slightly different than the patterns above where a one sided pattern is referred to as an AIC, and the same pattern on both sides is called a PEC. A one sided BC, usually a right BC, typically develops from a left AIC. Or simply, a one sided lower body problem usually gives rise to a one sided upper body counter-compensation. In this pattern, the ribs are flared on the left side and the trunk is bent over to the right. Because of the orientation of the ribs, the right shoulder blade sits lower and farther from the spine than the left side. This makes the shoulder blade inherently unstable and as it is the base of the shoulder joint, the right shoulder will not move very well. Patients with this pattern typically have some sort of right shoulder pain or pathology such as rotator cuff injuries, torn labrums, impingements, and/or frozen shoulders. When this occurs on both sides, the ribs are flared on both sides of the ribcage, the upper back is bent backward, both shoulder blades are low and far from the spine, and neither shoulder functions well. These postures can also affect the neck. There are many more postural abbreviations within PRI, but as these are the most basic and common, that's all we will cover in this post. You can now see how a few letters can convey a large amount of information and give therapists a great idea of what muscles will be over/underutilized, what joints are over/undermobilized, etc and how this affects our interventions. Want to know what pattern you're in and how to fix it? Contact the therapists at Integrate 360, the only PRI certified clinic in the St. Louis area, for your evaluation. Email us at Lesley@integrate360pt.com , Nancy@integrate360pt.com , or call us at 314-733-5000.